Whether you’re a tourist or a resident looking for an array of fun and top things to do in Hong Kong, we’ve got all sorts of tips around what to do in Hong Kong and recommendations for the best places to visit in Hong Kong. Read on! Hong Kong’s iconic skyline takes on a new glow as buildings each side of the harbour beam lights across the water. The Symphony of Lights spectacle takes place every night at 8pm. Head down to the Tsim Sha Tsui waterfront for the best view and marvel at Hong Kong island’s skyline at night. Hop on at Western Market and view the city with new eyes as the tram trundles through Wan Chai and Causeway Bay. It’s just HK$2.60 to experience this piece of iconic local culture. One of the best things to do in Hong Kong (which also won’t break the bank) is to take the iconic Star Ferry between Central and Tsim Sha Tsui. A ride on this famous Hong Kong tourist attraction will cost you less than $4 for the upper deck and give you spectacular harbour views of the city to boot. Running over 800 meters and rising 135 meters through the city to link the Central and Western districts, the Mid-Levels escalator is the world’s longest escalator system. There are 14 entrances and exits, linking Queen’s Road Central with Conduit Road. To ride the complete length of the escalator system one-way takes about 20-25 minutes. A good starting point is 100 Queen’s Road in Central. Spending a lazy day on a catered junk with friends is a popular weekend activity during the warmer months in Hong Kong. There are a number of companies offering all day junk trips. It’s been around since 1976, is commonly used in tourist brochures and postcards, and has even appeared in numerous movies including a James Bond film. Other than being a tourist attraction in itself, Jumbo Kingdom also serves Cantonese cuisine in an elegant and fine dining atmosphere. Renowned guests include Tom Cruise, Chow Yun Fat, and even Queen Elizabeth II. Hop on the free ferry from Aberdeen Promenade and head over to the floating restaurant to experience what it’s all about. Located in the South of Hong Kong Island, head to Aberdeen Promenade Pier or Wong Chuk Hang Shum Wan Pier by MTR, bus or taxi and hop on the free shuttle. Sure, it’s a bit clichéd and some of the bars may be tourist traps, but at least one night out in riotous Lan Kwai Fong is an expat rite-of-passage. There are plenty of bars and restaurants to enjoy, but you’ll find the party often spills out into the streets as Hong Kong’s laws allow you to consume alcohol in public spaces. The Ozone is located on the 118th floor of the International Commerce Centre (ICC) and claims to be the highest bar in the world. Other than an amazing view, the interior of the bar is also something to look at – decked out with a marble counter and mesmerising geometric designs throughout the space. It’s no surprise that they serve up quality cocktails here as well, serving up both innovative cocktails, or classics like Martinis and Cosmopolitans. If there’s one Hong Kong must see, it’s a ride on the historic Peak Tram, which first opened in 1888, from Central to The Peak. This is one of the best places to visit in Hong Kong for an iconic view of the city’s mesmerising skyline. There’s a mall where you can pick up some souvenirs, along with restaurants. The Mount Austin Playground is also fun for kids. You can’t go to Hong Kong without stopping by the city’s original theme park, one of the most visited Hong Kong tourist attactions. It combines an amusement park, marine park, oceanarium and animal theme park and promises a full day of fun for anyone who goes there. Kids are sure to love the animal theme park, where they’ll be able to see the famous giant pandas, Le Le and Ying Ying, plus a whole array of unique animals as well. For the adrenaline junkies, the Thrill Mountain is a must. There’s attractions for everyone here no matter what you fancy. The South Island MTR line takes you straight there. What’s a list of things to do without Disneyland in it, right? Another top Hong Kong tourist attraction, the park is scheduled for more expansions over the next few years and fans and visitors can expect a whole new experience and attractions unique to Hong Kong. New highlights planned include a Marvel-themed and Frozen-themed area, among other exciting new additions. In the meantime, visitors can still enjoy the Disney classics and other special attractions. These include Mystic Manor, a slight twist on the traditional Haunted House, and the Star Wars Hyperspace Mountain, a reimagined version of the classic Space Mountain. Built in 1847, this stunning temple is in the heart of buzzing Sheung Wan. The temple is a tribute to the God of Literature (Man) and the God of War (Mo), a go-to location for locals and those looking for academic or literary success. Though it has been been renovated over the years, the temple preserves the traditional Chinese architectural layout and is exquisitely decorated with ceramic figurines, granite and wood carvings, murals and more. Why not get your fortune told while you’re there and see what the future holds? Located on Hollywood Road, you can combine a trip to the temple with some antique shopping and art gallery hopping in Sheung Wan. Hong Kong has plenty of street markets but Cat Street is a fun collection of antique shops and kitsch curios, just off Hollywood Road and walking distance from Man Mo Temple. Although the official name is Upper Lascar Row, it is commonly called Cat Street now as many stores used to sell stolen goods in the past. Take a trip back into the past as you walk along this street and who knows, you might even find a treasure along the way. 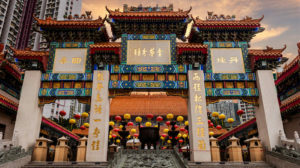 Another popular temple, and possibly one of Hong Kong biggest and busiest, Wong Tai Sin Temple swears to ‘make every wish come true upon request’. Many people head over to get their fortunes told, and pray for good fortune through offerings. It’s home to three religions – Taoism, Buddhism and Confucianism, and is the only temple in the country permitted to conduct Taoist wedding ceremonies and issue marriage certificates. If you’re only visiting one temple, this would be a good choice as it’s a huge complex, complete with several halls, shrines and even a garden. The temple is easy access from Wong Tai Sin MTR Station. A visit to this monastery is quite the spectacle with over 10,000 gold-painted Buddhas lining a steep path up. Be prepared to climb more than 400 steps towards the monastery, arguably one of Hong Kong’s most memorable cultural sites. Once you’ve managed to conquer the journey up, you’ll be rewarded with an amazing view over Sha Tin and the New Territories, plus the chance to explore the unique temple grounds. Do be cautious on your way up as you may come across wild monkeys that live in the surrounding areas, and make sure to check weather conditions beforehand. The entrance to this attraction is a five to 10 minute walk from Sha Tin rail station. You’d hardly believe that a place like this exists in the concrete jungle of Hong Kong. Originally built as a retreat for Buddhist nuns, the complex is wonderfully serene for those hoping to get away from the hustle and bustle of the city. Other than its beautiful architecture, the complex is even more unique in that not a single nail was used during its reconstruction in 1998. To demonstrate the harmony of humans with nature, the complex was completely designed using interlocking pieces of wood and is definitely worth a visit. The site is an easy walk from Diamond Hill MTR. This is one of Hong Kong’s last few fishing villages and a rare example of the old Chinese stilt-house community. The unique structure results in a tightly knit community with a rich, traditional culture that’s a stark contrast from the fast paced city area of Hong Kong. Don’t forget to try their specialties and street foods, most of which are largely seafood related. Must buys for locals who visit include the dried seafood, salted fishes and sauces available almost everywhere. Reach Tai O by getting the MTR to Tung Chung then taking bus 11 to Tai O, or a ferry to Mui Wo and then take bus 1. Both Tung Chung and Mui Wo have bus interchanges with signage so you can locate correct buses. Lamma Island has transformed from a traditional Chinese fishing village into a laid-back multicultural community, where its blend of Western and Chinese island culture creates an irresistible and unique atmosphere. Visitors will be able to find an escape from the busy city with plenty of fantastic beaches, hills and local temples to explore. A great way to see the island would be the Lamma Island Family Walk, a gentle hike that’s one of Hong Kong’s favourite and brings you through the forest, little temples and more. Lamma has two main villages, both accessible by ferry from Central Ferry Pier. Yung Shue Wan is bigger and busier than Sok Kwu Wan, so a better choice for visitors as there’s little stores to poke around in, as well as range of bars and restaurants. Ferry services are also more frequent. The trip takes about 30 minutes. This unique theme park contains the only full-sized replica of Noah’s Ark in the world, and is situated on Park Island, next to the Tsing Ma Bridge. It’s perfect for spending an educational day with the kids as they explore the different exhibits available. From exhibits on the solar system to interactive games and an exciting Adventureland, this is a fun yet educational place to bring the kids to. You can reach Park Island by bus, ferry, MTR or car. Some of Hong Kong’s excellent museums are open for free on Wednesdays and worth adding to your list of places to go in Hong Kong: the Museum of Art, Museum of History, Heritage Museum, Science Museum, Space Museum, Museum of Coastal Defence and the Dr Sun Yat-sen Museum. The Flagstaff Museum of Tea Ware, Hong Kong Railway Museum, Lei Cheng Uk Han Tomb Museum, and a handful of folk museums are free of charge every day, as are the exhibitions at the Hong Kong Film Archive and the Hong Kong Arts Centre. Click here to read more in our Things to do section!